This was wonderful. I made the following modifications: made 1/3 more sauce. Used only 1 package of spinach, which I mixed into the ricotta. 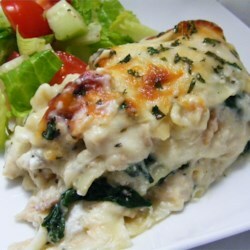 I layered in the following way: 1/4 sauce, 3 noodles, 1/2 ricotta/spinach, 1/2 chicken, 1/4 of sauce, 1/3 of remaining mozz/parm, 3 noodles, rest of ricotta/spinach, rest of chicken, 1/4 of sauce, 1/3 of remaining mozz/parm, 3 noodles, rest of sauce, rest of mozz/parm, sprinkled with fresh parsley.